Explore the full range of products that our Meteorology Division offers! Skyceiver_MSG was designed to meet the new standards in remote sensing pioneered by Meteosat Second Generation (MSG) spacecraft. 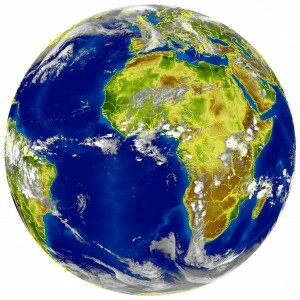 This new generation of satellite data processing and display make great use of advanced techniques of spectrum combination made available by modern spacecrafts. Complex data processing are automated to ease the daily routine work of each forecasters. Skyceiver_MSG while providing an unsurpassed range of features has maintained its traditional ease-of-use. 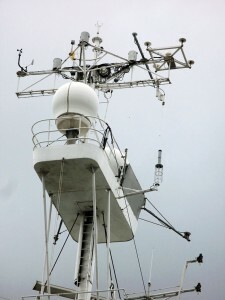 Sea SkyTrack is a reliable parabolic tracking antenna system designed to be installed on vessels. The 1.2 m antenna uses a high precision, high speed mechanism to accurately track and receive satellites signals.The Sea SkyTrack comes with a protective radome and mounting/tracking pedestal and works with HRPT, METOP, CHRPT, MSG, MT-SAT, and GOES systems. It is equipped with an integrated feed and a very low noise amplifier with a noise figure better than 0.55 dB permitting to obtain an overall factor of merit better than 5.5 dB/K from 2º elevation. The parabolic antenna is supported by a motorized pedestal driven according to the orbit pass by the control unit which is hosted inside the same protecting radome. A RS422 link from the indoor unit controls the accurate spacecraft tracking on the base of GP4 orbital model. Pointing accuracy is better than 0.5º . Both elevation speeds are 12º/s. The parabolic antenna and the pedestal are fully enclosed in a radome (spherical fiberglass rigid dome) for environmental protection. This permits much higher operative resistance to winds, higher protection to corrosion and protection against sediment build up such as sand and snow during storms. Because of the radome, maintenance and repair is made much easier. All components such as motors, gears and cables are accessible through a sealed door in the radome. When not in operation the antenna can be pointed to any visible geostationary satellite as a backup to the fix antenna without any worry of the current meteorological condition. This is not the case with dishes without radome, where wind conditions must always be kept in very serious consideration before placing in operation. The maximal RF attenuation introduced by the radome is less than 0.2 dB. Wind resistance is not related to the motor power anymore but only to the radome resistance and elasticity. 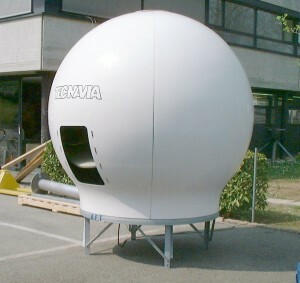 With proper fixing the radome will resist to winds (survival) of 200 Km/h. Maximum suggested operative wind speed is 150 Km/h. Temperature of operation is from – 30º C to + 55º C. In case of very low environmental temperatures it is possible to install a heating element controlled by a thermostat inside the radome. The antenna is provided complete with control and coaxial cable with plugs and “N” male connector to feed the indoor receiving system. Skyceiver CIRRUS is a multi-workstation, multi-satellite Ground Station based on PC networking for reception, processing, dispatching and displaying meteorological data. 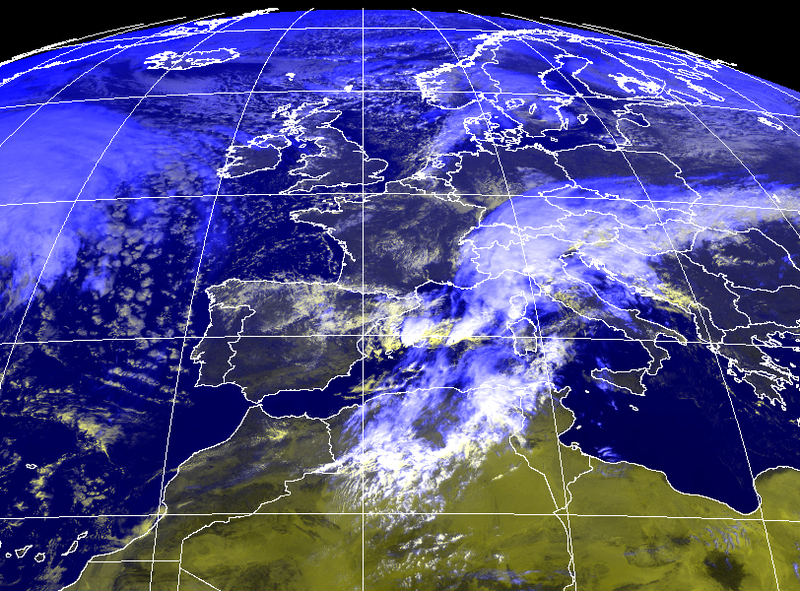 Dataset of several sources is supported: MSG, PDUS, HRPT, CHRPT, GVAR, METOP, MT-SAT, Modis, Radar, and other to come. TECNAVIA offers front-end equipment to be integrated into third party systems. Reliable and flexible system to archive your weather data. This system has been designed to provide permanent storage of data received from meteorological satellites on reliable DVD media. The equipment provides storage of products and raw data set permitting plain indexing through customized masks. Data retrieving is simple, fast and permits quicklook of products.